The GOP-controlled House Judiciary Committee is having themselves a very reasonable and neutral-sounding hearing on Planned Parenthood today, sensitively entitled “Planned Parenthood Exposed: Examining the Horrific Abortion Practices at the Nation’s Largest Abortion Provider.” Not invited to testify: a single person who works for Planned Parenthood. House Democrats—there are 16 of them on the committee, compared to 23 Republicans—responded sharply to the claims being made by the witnesses, as well as the entire fact of the hearing itself. “I’m still not entirely sure what this hearing is about,” said Rep. David Cicilline of Rhode Island, dryly. He pressed Bopp on whether he’d been told not to discuss the allegations of criminal activity against the Center for Medical Progress, who are accused of a variety of legal infractions in how they collected their undercover footage, as well as numerous IRS violations. “That’s not what this hearing is about,” Bopp responded, a little peevishly. “This hearing was political theater at its very worst. From the provocative title to the slate of life-long anti-abortion activists invited to testify, it’s clear this hearing was not about Planned Parenthood —- it was a chance for anti-abortion extremists and members of Congress to promote their political agenda of banning abortion in this country. 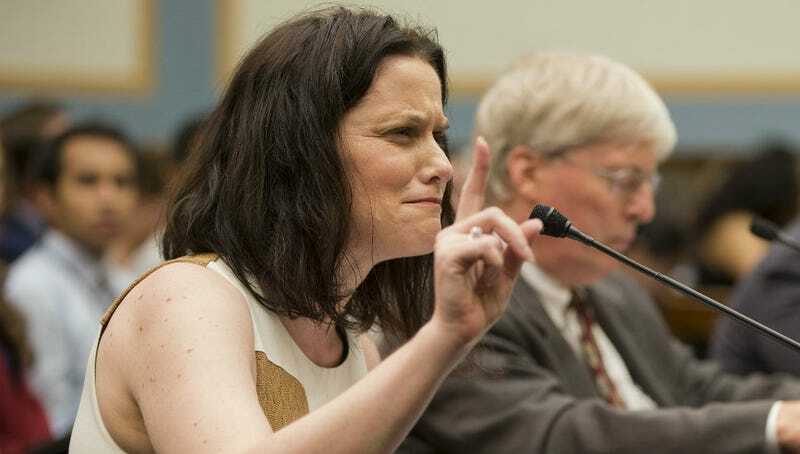 Gianna Jessen testifies at today’s hearing. Image via AP.